I have found myself reflecting recently on a few character traits, specifically those of honesty and trust. Not just mine, or others, but those traits in general. It was actually an incident at work the other week that triggered these thoughts and reflections. It got me thinking about instances in my past, and my personal feelings and beliefs on honesty and trust. But then it got me thinking as to why? Why do I even have those particular feelings, and where did they come from? I think if you would ask most anyone, everyone would give you a similar answer, that they value honesty and trust. But just because you value it, it could very greatly from person to person how that applies in their everyday life. No one is perfect and delivers these traits regardless, it is all very circumstantial. For me, I am the person that gives you my trust right off the bat. It is there, and only you can take it away. I know with others it has to be earned in a "prove it to me" sort of way. Why do I do that? Why do I automatically instill my trust in others? I have had many situations in my past that you would think would lend itself to adjusting that behavior in me, yet still it hasn't changed. Though once my trust is gone, it is a beast to get back. Honesty. I have never been able to tell a lie, even from a young age. I never had any conviction behind it, and I always got caught. I definitely have that naive belief that because I come from a place of honesty, others around me do too. Again I approach it with a "I believe you until you prove me wrong" attitude. If you can't be honest with others, how can you be honest with yourself? We are all dishonest with certain things, smaller things that don't have as much meaning to us personally. I'm thinking more big picture, in defining your personal character. Those who are consistently dishonest, my guess is that they don't think they are. But what do they think? I feel most of us have the magic way of justifying most situations so that we ourselves are not in the wrong. I think because of my feelings and opinions on trust and honesty I take it very personally when I don't receive what I have given in return. I found this quote below that helped me to put some things into perspective. In thinking that where respect is given respect is received, I get that one. Easy, check. Honesty is appreciated, but not required. Most people want to be appreciated, I know I do. Could it be my need to be appreciated that drives my natural instinct of honesty? Trust is gained, when you do things that I appreciate, like being honest, it helps to gain my trust. Loyalty is returned - you give loyalty to me, I give loyalty to you. It seems self explanatory, but it doesn't always work that way. Why? What does that mean when it doesn't work that way? I strive to live as elegantly and gracefully as possible. And all I can know is what that means to me. 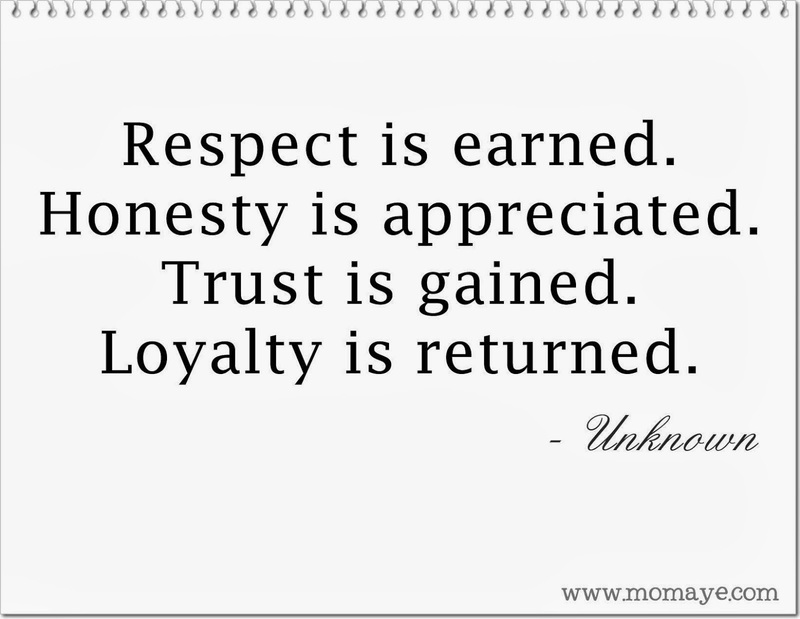 I will always uphold myself to my highest standards of respect, honesty, trust, and loyalty. Which means I will always give everyone all of what I have to start, and hopefully they will want to keep it. If not, my quest is to not take it so personally, I'll just attribute it to some sort of internal character flaw on there part, no? It doesn't work like that? Just kidding. Or is it a flaw on my part to always give all of what I have from the start? I definitely don't have the answers. But I am very curious as to how we develop these traits and how they are molded overtime. Food for thought.